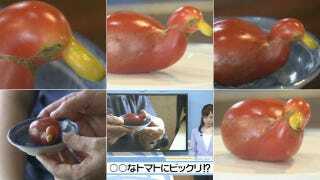 In Shizuoka Prefecture, there's a tomato that looks like a duck. A local restaurant got a bag of produce from a customer, and in it there was this. Part of it had yellowed, forming the bill, and a spot looks like the duck's eye. The restaurant owners thought it looked too cute to eat, so they've put it on a plate to pull out and show people. You know what they say, if it looks like a duck and tastes like a tomato, then it's a tomato.